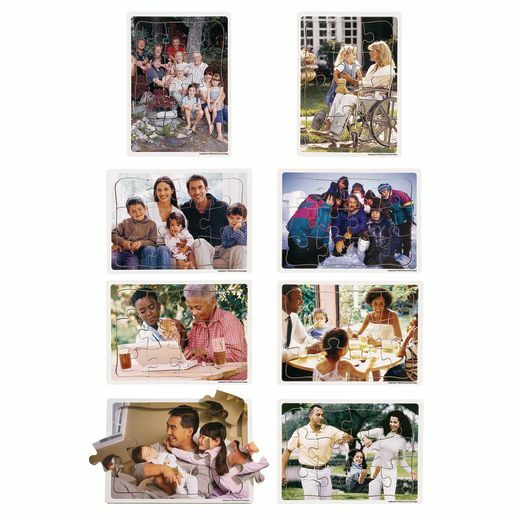 A world of families brought together in our exclusive set of 8 colorful wooden puzzles. SOC (2) Understands that individuals, groups, and institutions share common elements and also have unique characteristics. SOC (3) Understands individual choices are influenced by personal and social factors. SOC (1) Understands concepts such as: community, culture, role, competition, cooperation, rules, and norms. SOC (3) Understands the impact of families, schools, religious institutions, government agencies, financial institutions, and civic groups on their lives.